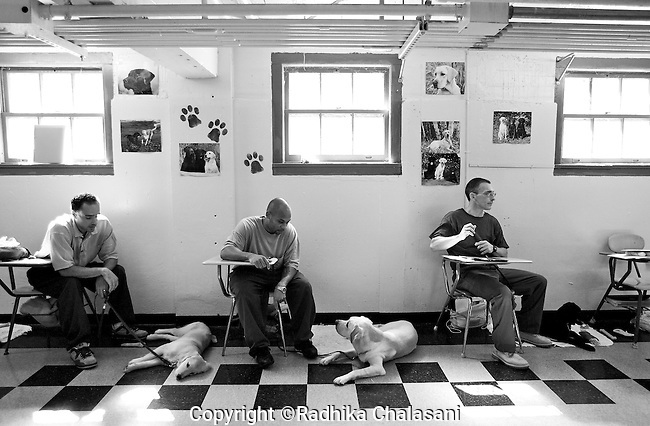 BEACON, NEW YORK: Jesse, Ian, and Bobby (L-R) in class with instructor Carl Rothe of the Puppies Behind Bars Program at Fishkill Correctional Facility. The puppies arrive at 8 weeks-old and remain at the prisons, mostly working with one inmate, for approximately 20 months. Fishkill Correctional Facility is a medium security prison in New York with 22 men in the puppy program.